If you’re an existing patient, you can log into the patient portal by clicking on the SIGN IN button. If you have never logged into the Patient Portal, please call our office at (972) 758-5484 and we will send you an email with credentials and instructions on how to use the portal. Our staff is happy to offer professional assistance in filing your insurance. Dr. Cooley participates with most major insurance plans including Aetna, Blue Cross, United Healthcare, CIGNA, Medicare as well as many other preferred provider insurance plans. Your insurance coverage is an agreement between you and your insurance company. Some procedures require pre-authorization. Please check with your insurance company to see if you will need to acquire a pre-certification for your procedure. Have an insurance question? Please call us at (972) 758-5484, and we would be happy to help! Plan to arrive 15 minutes prior to your appointment and have a means of covering your financial portion as determined by your insurance plan. If you will be paying by credit card, we accept Visa, MasterCard, AMEX and Discover. Dr. Cooley performs procedures at Endoscopy of Plano located within Medical City Plano hospital in Suite 401A. If you have a question about the procedural prep instructions, please contact Dr. Cooley’s office at (972) 758-5484 with any questions. 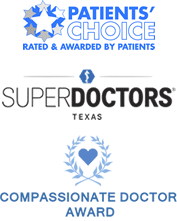 As a member of the Digestive Health Associates of Texas, Dr. Cooley’s billing is handled by the central billing office. If you have a billing related question, please call (214) 689-5960. For prescription refills please contact your pharmacy and have them call our office at (972) 758-5484 to refill your prescription.